Sister Sharon Costello, second from right, with the Sisters of St. Joseph team and Sisters of Charity of the Incarnate Word team, at the initial workshop of Advancing Mission 2.0. Sister Sharon Costello, the congregational moderator for the Sisters of St. Joseph of Baden, is no stranger to building relationships. The former elementary school teacher and administrator and former executive director of Girls Hope of Pittsburgh has known that crafting relationships is important to helping a congregation connect with a community. The 150-year-old congregation’s mission is to bring all people together with each other and with God. This includes programming ranging from addressing food insecurity in its neighborhood to caring for the earth and environment. The congregation reached a crossroads, though, when it transitioned to a new leadership team with new directions. Then came the invitation in the mail. “We received the invitation to apply for Advancing Mission 2.0 program through Lake Institute on Faith & Giving, but wondered whether we wanted to respond,” Costello recalled. “We were intrigued by the title ‘Advancing Mission.’ Throughout our history, our goals include advancing mission. We try to be attentive and responsive to whatever the needs around us are at the time and to respond and serve in whatever ways we’re capable of doing. Hesitant but curious, the congregation reached out to Lake Institute to learn more. After the conversation, Costello and the other members of the leadership team knew it would propel the congregation forward, so they decided to apply. After learning they had been accepted, Costello and another team member and lay staff participated in the first workshop of the program in early December, which featured experts in faith-based fundraising. 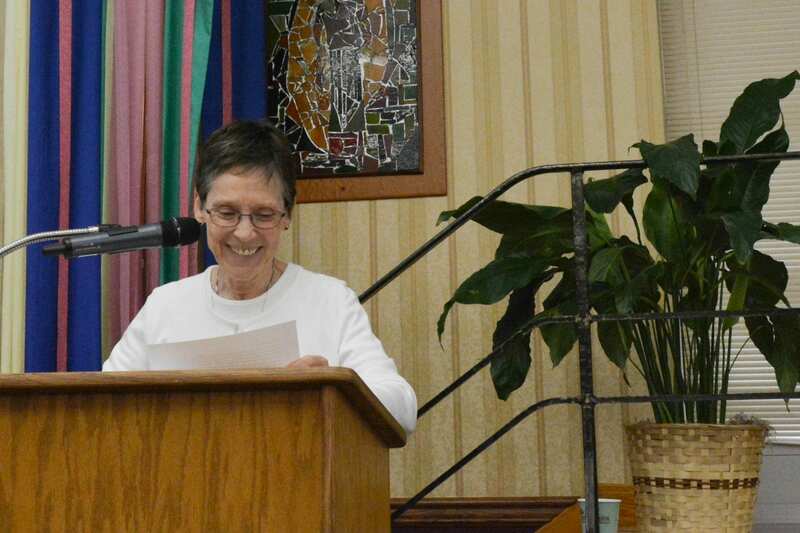 Sister Sharon Costello addresses members of the congregation during their five-year Chapter gathering this past summer. For Costello, it was an enriching program that helped expand her consciousness on development and fundraising. “Throughout the sessions, we received input on how to shift from an institutional-centered model of fundraising to a donor-centered model. It’s all about building relationships, which aligns perfectly with our mission,” she said. For Costello, the change in consciousness and awareness helped connect fundraising and development to a higher level. “We’re not just asking people for money; it’s something much more significant. When people form meaningful, powerful connections to causes they care about, they are able to invest in something they believe in and live out their spiritual values,” she explained. In the next 12-24 months, Costello and the Sisters of St. Joseph of Baden will work with Lake Institute and a consulting firm, which will conduct a fundraising and communications audit. Throughout the process, Costello looks forward to learning more about and deepening the congregation’s mission with people across generations. “We have programs of interest to people from the Greatest Generation to the Gen Zers, so we want to determine how we can engage in new ways with these diverse generations,” she said. For now, Costello is excited to continue sharing the lessons learned from the first workshop with the sisters and staff in in her congregation: “Whenever I talk about this program and what we’ve learned, I can feel my energy level increasing all over again. Thanks for sharing the advancing mission story and supporting women religious!